This Water Resistant Vinyl Surveyors Umbrella has a 63-inch spread and 8 foot 3-section pole with baked aluminum enamel finish. Umbrella pole tapers down to almost a point but it has approximate 1/4 inch opening in the tip. 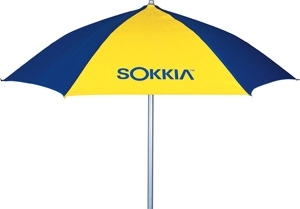 Model 813641: Water Resistant Vinyl Surveyors Umbrella with blue and yellow with logo.